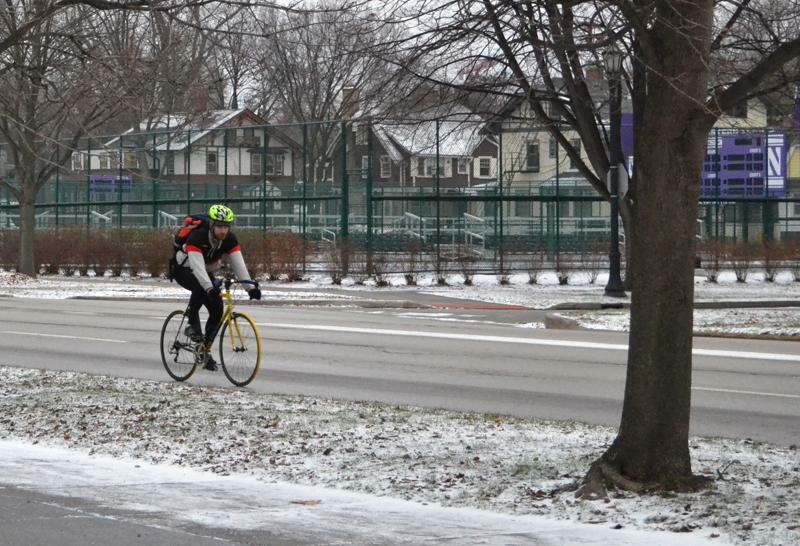 A cyclist rides down Sheridan Road. The Active Transportation Alliance honored Evanston for the city’s efforts to create public spaces that support biking, walking and transit last week. A Chicago non-profit transportation organization has presented Evanston with a leadership award for making its transportation more environmentally friendly and accessible to residents. In addition to the city, the Active Transportation Alliance has given the Public Leadership Award to Chicago aldermen, spokesman Ethan Spotts said. In coordination with the alliance, the city has been developing strategies to make transportation more comfortable for people, said Suzette Robinson, Evanston director of public works. In November, the city secured $480,000 to create a protected bike lane on Dodge Avenue. The city also plans to create a bike lane on Sheridan Road from Chicago Avenue to Isabella Street. The design for the project will be released in 2014 and construction will begin in 2015, Robinson said. Funding for the project will come from a mix of federal and city funds. The 2014 fiscal budget allocates about $37,458 for the first two phases of the bike project. The alliance helped the city reach the status of Bicycle Friendly Community at the silver level, which was awarded by the League of American Bicyclists last year. The transportation organization has also provided the city with regional research, Robinson said. In early 2013, the organization worked with the city to improve pedestrian safety. The city is considering implementing environmental policies that could help secure federal and state grants for transportation projects, Robinson said. The city’s Environmental Board has drafted a “complete and green streets” initiative that focuses on providing multiple modes of transportation while minimizing environmental harm. Board members will present the plan to city officials Dec. 9. The Chicago Metropolitan Agency for Planning this year provided Evanston with a $100,000 grant, which the city will use to gather public input about updating the city’s bicycle plan in conjunction with a consulting firm. In collecting input from residents, the city hopes to find a balance between the needs of bikers, drivers and pedestrians, Robinson said. Residents sometimes feel frustrated when bikers or drivers break the rules of the road. “We are trying to design a corridor that reduces some of that tension so anyone can get where they need to go,” Robinson said.